Anyone interested in a PhonePad? A Phonablet? Tabhone? Phablet? 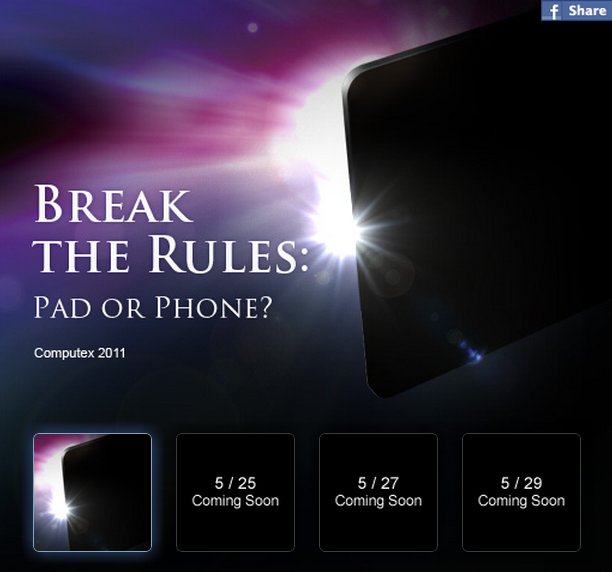 Asus is apparently preparing to unveil one at Computex 2011 and have opened up a teaser site for it with the slogan “Break the Rules: Pad or Phone?” Our instinct is definitely telling us to assume it’ll run Android especially after seeing some early success from their Transformer Honeycomb tablet, but is a hybrid phone/tablet something to get excited over? We’ve already seen 7″ unsuccessful slates from big time players like Samsung and 5″ Dell Streaks that no one bought, so what would make Asus stand out from the crowd? It’s tough to tell from the images that have been released through Tech in Style, so we’ll leave the creativity and imagination to you.